Platelet-rich plasma (PRP) (also known as blood injection therapy)) is a medical treatment being used for a wide range of musculoskeletal problems. Platelet-rich plasma refers to a sample of serum (blood) plasma that has as much as four times more than the normal amount of platelets. This treatment enhances the body’s natural ability to heal itself and is used to improve healing and shorten recovery time from acute and chronic soft tissue injuries. It has been used for years after plastic surgery and surgery on the mouth, jaw, and neck. It seems to promote bone graft healing. Researchers have found a way to combine this substance with other chemicals to make it into a putty or gel that can be painted on a surgical site to speed up healing. Blood injection therapy of this type has been used for knee osteoarthritis, degenerative cartilage, spinal fusion, bone fractures that don’t heal, and poor wound healing. This treatment technique is fairly new in the sports medicine treatment of musculoskeletal problems, but gaining popularity quickly. Platelets are part of the blood that circulate around the body ready to help with blood clotting should you have a cut, broken bone, injury that bleeds internally, or any other type of injury. Besides containing clotting factors, the platelets release growth factors that help start the healing sequence. With a concentrated amount of platelets, larger quantities of these growth factors are released to stimulate a natural healing response. Plasma is the clear portion of the blood in which all the other blood particles such as platelets, red blood cells, and white blood cells travel. In theory, blood injection therapy could be used in any area where a rapid healing response is desired such as the tendon-muscle junction, muscle injuries, torn ligaments, damaged joints, or inflamed tissue (e.g., plantar fasciitis). Torn tendons and ligaments don’t always heal well because they have a poor blood supply. Connective tissues such as ligaments and tendons heal by filling in with scar tissue that doesn’t bear the brunt of large loads well. This increases the risk of re-injury. Other available treatments for chronic tendon problems do not necessarily improve the tendon’s ability to heal in the same way that PRP does. And injections of PRP don’t have the side effects that can occur with steroid injections or long-term use of non-steroidal anti-inflammatory drugs (NSAIDs). PRP treatment might also be used on the skin where delayed wound healing has created a site open to infection or for a pressure ulcer that is open and draining. Patients with non-healing ulcers from poor circulation related to diabetes, paralysis, and immobility, and chronic neurologic disorders may be able to receive gel treatments to achieve healing. Since the early 1990s, it has been injected into non-healing tendon tears, fibrosed (scarred) tendons, and osteoarthritic knees. There has been some limited use with bone fractures. Because the growth factors released by the platelets can stimulate bone mineralization, platelet-rich plasma may help a break in a bone that isn’t healing. It has also been used with bone grafts to help spinal fusion along. Patients with chronic tendinitis (e.g., tennis elbow, patellar tendinitis or jumper’s knee, Achilles tendinitis) have also benefited from this treatment. It’s even being tried on hernias, labral (shoulder cartilage) tears, meniscal tears of the knee, and ankle sprains. Some surgeons are using it more and more with any orthopedic surgery involving the soft tissues to augment (reinforce) bone or ligamentous graft materials already being used. The main purpose of platelet-rich plasma injection is to foster healing where it has not otherwise occurred or to speed up healing as in the case of an acute injury. Platelets release bioactive proteins that enhance tissue regeneration and healing. For example, studies show that after using the platelet-rich plasma (PRP) for tendon problems, new tendon cells (called tenocytes) start to develop in the area treated. Chondrocytes (cartilage cells) form when PRP is injected into damaged cartilage. Growth factors that help build new blood supply to the area are also increased in number. At the same time, there is a build up of type I collagen fibers. Type I collagen makes up the base structure of tendon tissue. This healing response may help restore strength faster than normal but studies are needed to prove this. Not everyone with a musculoskeletal problem as described can have this treatment. Anyone with a condition called thrombocytopenia (low platelet levels), anyone with a history of cancer, and women who are pregnant or breast-feeding will not qualify. Thrombocytopenia can occur with drug treatment for blood clotting disorders, rheumatoid arthritis, or some forms of chemotherapy for cancer. The use of blood thinners such as Coumadin or Warfarin and the presence of infection in the wound site are also contraindications (reasons why platelet-rich plasma is not an option for you). How will I prepare for this procedure? 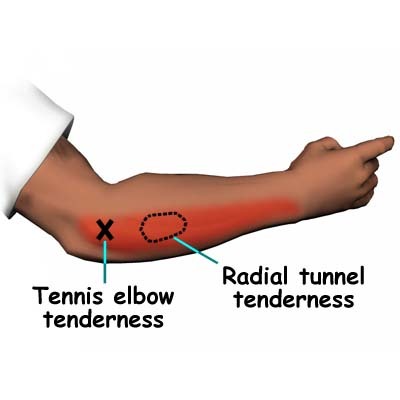 The procedure can be used non-surgically when treating tennis elbow, muscle injuries, joint osteoarthritis, or cartilage degeneration. Most non-surgical procedures can be done on an outpatient basis, usually in the office setting. When used during surgery, platelet-rich plasma is inserted in the area where the healing needs to be enhanced before the wound is closed. PRP is added to enhance ligament or tendon repairs such as anterior cruciate ligament (ACL) reconstruction, rotator cuff repairs, or Achilles tendon repair. 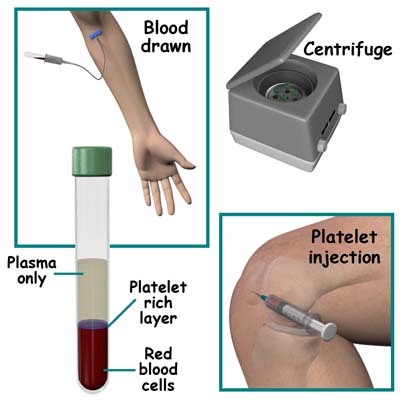 Treatment with platelet-rich plasma is broken down into two steps: preparing the platelet-rich plasma for injection and then injection into the affected area. First, blood is drawn from your arm and used to create the injected fluid. The blood is placed (in a test tube) in a machine called a centrifuge. The centrifuge spins the blood fast enough to separate it into layers based on weight. Heavier parts (e.g., red blood cells) stay on the bottom. Platelets and white blood cells spin out just above the red blood cell layer. Lighter particles (plasma without platelets or blood cells) make up the top layer in the test tube. Once you have had your blood drawn, the sample is prepared right away. You can have the injection as quickly as 30 minutes later. 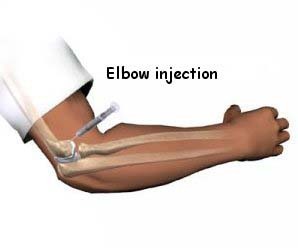 Once the PRP has been prepared, it is injected into the damaged area (e.g., tendon, muscle, cartilage, joint, bone). The surgeon may use imaging such as fluoroscopy (real-time, 3-D X-rays) or dynamic musculoskeletal ultrasound to place the needle that delivers the PRP directly into the joint or other area of injury. You will not be asleep or anesthetized unless the plasma is applied during a surgical procedure. When used on an outpatient basis for a nonsurgical treatment, a numbing agent like novacaine (e.g., lidocaine, marcaine) is used so that you don’t feel anything. For open incision or arthroscopic surgeries, such as labral and meniscal repairs or tendon or ligament repairs, the PRP is placed around the anchors and sutures holding the soft tissues together. Tiny clots form quickly, then the surgeon ties the sutures down reducing the tear, thus trapping the PRP clot in the repair site. Early attempts to use this procedure contained four times the normal amount of platelets but surgeons have found they can use far less than that to achieve the same result. Scientists are still actively studying the best way to use this treatment. It’s not clear yet just how much platelet-rich plasma is needed to get the best healing response. The number of injections needed and the time frame remain yet to be determined as well. In studies done so far, one to three injections have been used with one to two weeks between injections. Immediately after the procedure, you will remain lying down and under observation for a few minutes up to a half an hour. 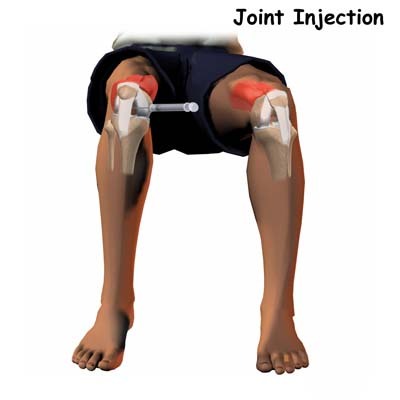 You might have some discomfort in the area of the injection that can last a few days up to a week. In fact, sometimes it can seem like you are worse than before the treatment. That’s because an inflammatory response has just been stimulated. Don’t worry – the temporary worsening of your symptoms usually won’t last. Once you return home, you can use ice over the injected area, elevate the leg or arm, and limit your activities as much as needed to remain comfortable. Your doctor may suggest using Tylenol for pain relief but ibuprofen or other anti-inflammatories are not advised. That’s because the treatment is designed to set up an inflammatory response, so you don’t want to stop that process with medications. The most surprising aspect of recovery after treatment with platelet-rich plasma is the speed of recovery. For example, high-level athletes find they are able to return to full sports participation and competitive play in half the time expected for acute tendon injuries and with no bad side effects and no scar tissue or adhesions. Similar findings have been observed in a small number of patients participating in a pilot study when platelet-rich plasma was used during surgery to repair ruptured Achilles tendons and rotator cuff tears. Once again, wound healing was much faster with fewer problems and less scar tissue. The majority of patients report being pain free. And the list of improvements with this treatment continues: patients use less pain medication, patients gain greater joint motion over a shorter period of time, patients get back to regular daily activities with greater speed and ease, and so on. In some programs where platelet-rich plasma injections have been used for tendon problems, patients were allowed to do light activities after a second injection given 15 days after the first injection. Strengthening exercises were started after a third (and final) injection given 15 days after the second injection. You may see a physical therapist after this procedure to help you regain motion, strength, motor control, and function. There isn’t a known rehab protocol (standard program to follow) yet. Physical therapists are working with surgeons on a patient-by-patient basis to determine what might be best for each individual. Developing optimal tendon healing and muscle strength, will be a priority especially in high-level professional athletes who are eager to get back into the game.